* Source: Zephyr StyleADVISOR and Swan Global Investments. 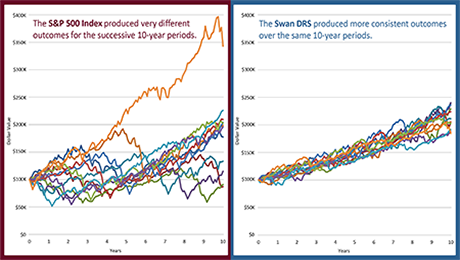 All data based on historical performance of the S&P Total Return Index and the Swan DRS Select Composite. Prior performance is not a guarantee of future results. Source: Zephyr StyleADVISOR and Swan Global Investments. 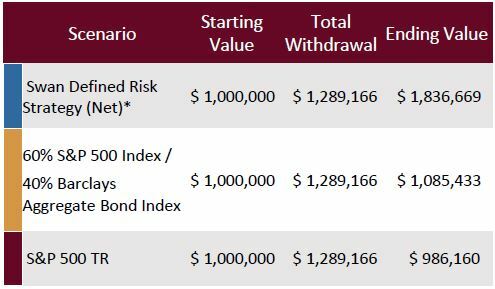 Calculations based on monthly withdrawals of $5,000 per month. * All data based on historic performance of the Swan DRS Select Composite. Timing is Everything, Or Is It? Learn more about the various types of investment structures we make available and be sure to consult with your investment advisor about the suitability of these different vehicles.